In this episode of The Functional Medicine Radio Show, Dr. Carri’s special guest Dr. Todd Sinett explains the solutions for back pain – including the connection between diet, stress, and back pain. 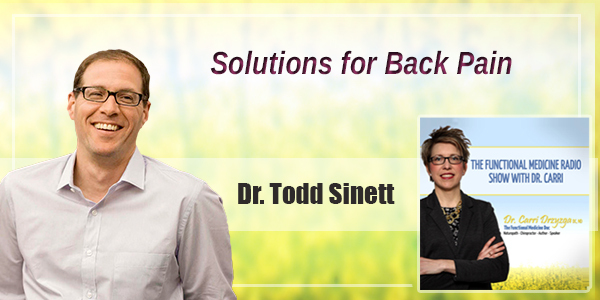 Dr. Sinett is a chiropractor and author of the book 3 Weeks to a Better Back: Solutions for Healing the Structural, Nutritional and Emotional Causes of Back Pain. Inspired to develop a new core philosophy to dealing with back pain, Dr. Sinett discovered that the root cause of back pain is not limited to structural issues, nor can it be simply resolved through treatment. He also found that a person’s emotional health and nutrition are equally important to uncover and address the root causes of back pain. What do our bowel movements say about our health? How can we eat to beat pain? What about the mental-emotional aspect of treating back pain? Back pain, in 2014, was named the number one reason for job disability, is the third most common hospitalization, and the fifth most common surgery. We spend upwards of about $80 billion per year diagnosing and treating back pain. About 85% of the world’s population will suffer from back pain at some point in their life and about 20% of the world’s population is currently suffering from back pain. Back pain is a true, worldwide epidemic. Back pain can be caused by diet. My father went from being unable to stand up and completely bedridden to going back to work and playing tennis within one month. Even now when I say to patients that their back pain is caused by their diet, they look at me like I’m crazy until I’m able to go over the reasoning how diet can have an impact on the back. Your back pain is not coming from your back. The symptom is your back but the problem is not necessarily your back. That’s a very important concept and once you’re able to address that concept, the possibilities of diagnosis and treatment really open up very large and that’s very important. How your digestive system is functioning is vital to see how your muscular system is functioning. If you’re constipated, your muscles are going to be much more achy. If you have a lot of diarrhea, your muscles are going to be very sensitive. In the book we have a complete bowel chart that shows you specific pictures of what the bowel movement should look like. It should be solid enough but not too hard, not too soft, and should be a fairly lightish color brown. How your digestive system is functioning absolutely affects your muscular system. There are reflexes in the body called visceral-somatic reactions: visceral meaning organs and somatic meaning the muscular system. So when your digestive system functions well, your back is going to function much better and when your digestive system is not functioning well, your back is not going to be functioning better. Patients who are diagnosed with Crohn’s or colitis or Irritable Bowel Syndrome have a much higher rate of back pain than the general population. There’s a direct correlation there. When it comes to diet and nutrition, you want to pay attention to see how your bowel movements are doing. Each individual person’s diet and what functions for them is integral and unique to them. The way to uniquely evaluate is simply based off the bowel movements. The concept of athletes wanting to eat proper nutrition for proper muscular function is a concept everyone will subscribe to. They’ll take good vitamins, eat lean proteins and good high-quality foods to have high function. But what happens if we flip that and said what if you’re eating not high-quality foods, what’s going to happen to your muscular function? It’s going to dramatically negatively impact your muscular function. Where it can obviously affect the muscular function is in your back. I have the No More Back Pain Diet which affects the vast majority of people where we really want to clean up your diet and get you healthier and eat better. There are elimination diets where you want to be able to figure out specifically what could be creating the pain and discomfort. It could be something where patients keep having the same foods over and over again. Too many salads, too much roughage, too many green drinks, too much oatmeal. It could be where we discover someone who has a gluten, wheat, or dairy sensitivity. You really want to evaluate what your diet looks like. You want to look at the foods you’re eating on a regular basis. The great thing is that your body will tell you. If you have a dairy sensitivity and you have spaghetti and meatballs or lasagna with a bunch of cheese and your digestive system feels off and you wake up the next day a bit achy, you could see a pretty good correlation that perhaps the dairy in the cheese was part of this. The diets in the book allow you to hone in on what your specific triggers may be that could be creating digestive upset which could then create the back pain. A fascinating fact about back pain is a study run by Stanford University on over 3000 Boeing employees. They really wanted to figure out the number one predictor of who’s going to have back pain and who won’t and what the main number one factor for back pain is. The results showed that the number one cause of back pain is emotional stress and outlook. Emotions and stress are the number one factors when it comes to back pain. It’s not the structure, not the diet, it is emotions. When we’re uptight, that’s a literal definition, because what’s happening is our muscles should contract and relax and when our bodies stay stressed for so long, our muscles contract and contract giving us more and more tension to the point where we have spasms and pain. There have been studies that have shown that anti-depressants have worked better than anti-inflammatories for back pain which in hindsight makes sense because since emotional stress is the number one factor. I’m not saying that the way to get rid of back pain from a stress induced problem is the anti-depressants but you want to do everything you can to cut down and stop that physiologic stress response. The first thing is to get in touch with your emotions to figure out what you may be stressed with and really give it some thoughts. I recommend a deep breathing technique where you’ll inhale for four seconds, hold it for four seconds then exhale for four seconds. If you do that over two minutes, slowing down and changing your breath, it can have a profound impact. You want to take a look at your diet and nutrition and kick up your exercise, go out for walks. Listening to music is proven to dramatically reduce stress. You want to dial it all back and figure out what works for you. Three weeks is enough time to change your habits. We’re going to take your unhealthy habits and turn them into healthy ones and your back is going to feel much better. Any time I examine a patient, we want to look at the whole patient. We want to get balance in the structural, look at their diet and nutrition, and their emotions and stress. A lot of times a patient will have all three. How much time is a patient is sitting at their desk hunched over all day, stressed out, a bit overweight, and not exercising? If you have poor alignment, you’re going to have poor function. A common factor we found with patients is called core imbalance. You need a balance between forward bending and backward bending. We’re spending entire days bent forward. That’s called flexions. Too much forward posture creates so much pressure on the spine so you want to put extension back into your body. There are different extension exercises you can do. That was so common I designed and created a product called the Back Bridge. What that does is that puts progressive extension into one’s spine. You lay on it two minutes in the morning and two minutes in the evening every day. As you continue to improve, it has five levels. I call it the Invisalign for the spine. Then we’ll get into diet and have a patient write down everything they eat and drink for a week. We’re looking for unhealthy foods and eating a lot of the same food. We’re going to recommend they have three different types of breakfasts, three different types of lunches, and three different types of dinners. We want to cut down on the sugars, caffeine, and alcohol and see what kind of response you get in those three weeks. Lastly, we want people to get out and be active and work on their stress. We do biofeedback where we measure their stress response in the office. We want them out walking. We want them breathing slower. We want them getting in touch with their emotions. Guess what happens? The vast majority of these patients, whether they’re suffering from severe back pain or they’re just suffering from some mild chronic nagging back pain, they’re going to be better within three weeks.